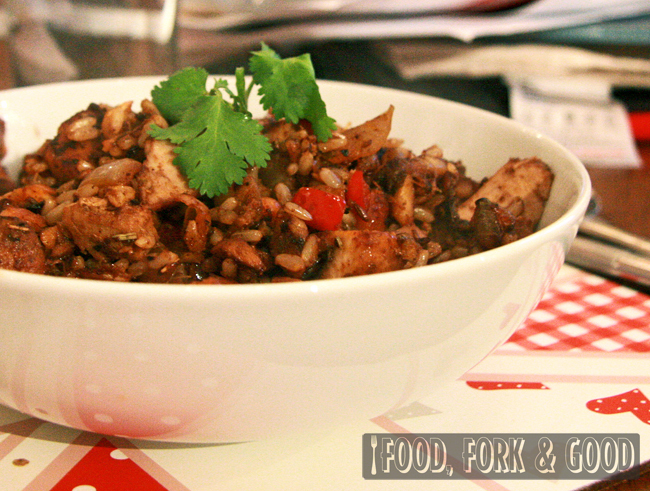 Winter Spice Rice & The Community - Fork and Good. I am a blogger. If you are reading this, then there is a high chance you are too. If not (hello mum!) then you're probably a friend of mine, or someone I know through other blogs. However I know you, you're here and you're reading this blog. I swear to god, I have a point. I'm not sure how many of you know of the recent twitter dispute that happened between a highly regarded Michelin star chef and an amateur blogger. I won't name names, or link up, most of you probably saw it in the news. I think it's unfair to saddle either with more negative press. An amateur blogger, not unlike myself, wrote a review (that was fairly nice) about a meal he'd had at a restaurant. The only thing he'd written negatively was the starter. The chef, seeing this, went to twitter and started a tirade of abuse at him which over the last day turned into a full scale war of words in which everyone stuck their oar in. I don't know, and couldn't be bothered to read, any further into it, so I'm not well researched, but I'm guessing there is two sides to the story, and both are probably in the wrong. What I did see on the news article, was a little comment about how annoying and pretentious all food bloggers were, thinking they 'were all that' when they were nothing. Underneath, quite a few people were joining in and agreeing. Food bloggers were suddenly put under the limelight as being "pretentious know it all's" and "think they know better whilst they hide behind there computer screens", or even "That they aren't even professional writers, yet they think they know everything, passing judgment on people like that". The bittersweet irony in that unprofessionally written comment, making a judgement on a whole group of people, whilst sitting comfortably behind a screen. Sure, I've pretty sure I've come across a few blogs like that. I've had other food bloggers tell me I'm doing it wrong, or that my recipe is pants, or that my method is awful. I had one cheerful fellow who wrote "You write too personally and use too many quotation marks". As you can see. I took that advice 'fully on board'. Naw, I'm just playing now. So do I rant and rave and shame these people? No. I just choose not go to their blogs. Simple as that. It's their opinion and they are entitled to it. I wouldn't judge every other blog/website I come across because of one bad egg. Some people just have to let every opinion they think be known. To everyone. To judge them for that wouldn't make sense. Saying that, 100% of the blogs I follow and enjoy are from women & men who enjoy cooking and want to share that passion with like minded people. Some earn a tiny bit of money from it. Others find friendship and gain experience and knowledge from this community. Sure, we come across the odd troll, who'll claim you aren't "professional" and "not a real writer". But, what makes someone a real writer? Trained? Grammatically correct? Because I read certain news websites that can't spell for spades, and there are certain "professional, business run websites" that make me go cold with their impersonal style. 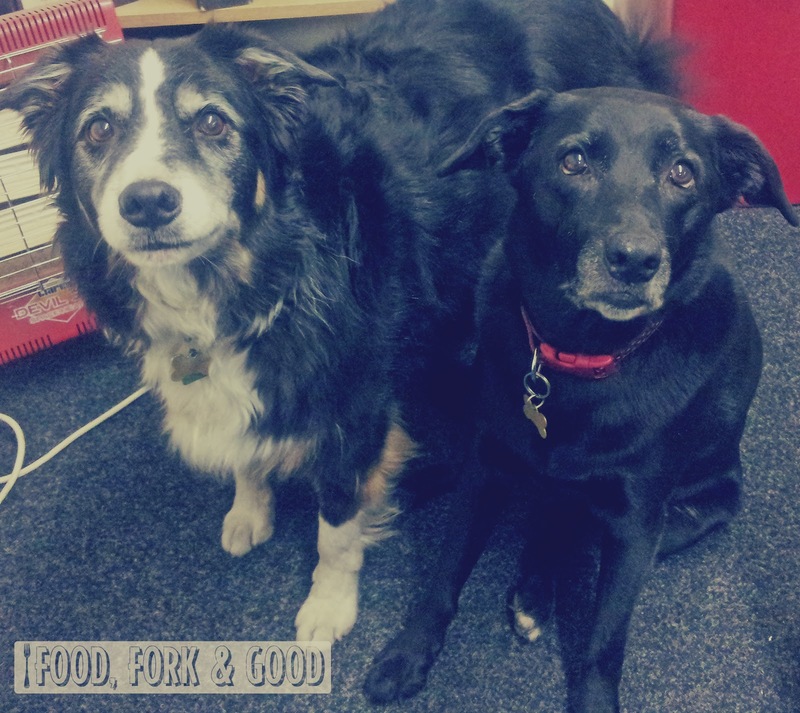 These blogs are written by real people, it's like opening up a families recipe book and gaining an insight into how they came to be. The pies may be wonky, the bread may be a funny shape, the pictures might not be professional, but it's personal and enjoyable to read. Bloggers intertwine their daily lives and knowledge into their writing and most of the time it's hilarious, or endearing. When you hear the story behind a recipe, it comes alive. From reading other blogs I learnt how to properly carve a chicken. I learnt about different cultures. I was introduced to new family members. I found out finally why baking beans existed. I learnt conversions and felt the festiveness of other countries traditions by their celebrations posted in my feed. I got fantastic meal ideas. I got a helping hand in feeding my veggie friends. You name it, it's a big foodie support system. 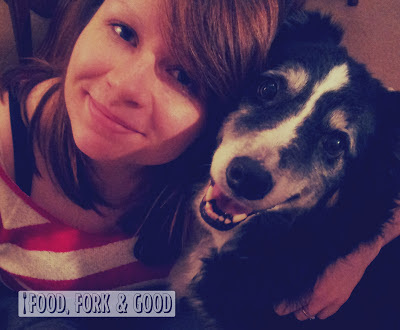 No, not everyone is going to agree with everyone, but as far as I'm aware, my food blog is mine to share and I've really enjoyed writing it and discovering other people's ones too. I'm not here to belittle anyone, and I'm certainly not fooling anyone into thinking I'm a trained chef. It's an outlet. My own little wonky recipe book. If people don't like it, or think I'm a pretentious know-it-all, they all they have to do, is click that little x in the corner and I'll be gone. In the meantime, I leave you with my paupers dinner. the freezer stock has come out of retirement as it's 2 weeks to payday and I'm very low on funds. Everything in the dish was made from things from my pantry, leftovers & freezer stock. The pork I used was from a leftover meat from slow cooked pork loin in cider recipe I'd tried out the day before. I could eat this right now. I'm so hungry! Not the best pictures I know, but it gets dark so early now. Done. Easy peasy pudding 'n' pie! To end on a positive note, here's a smiley picture of me and my families dog, we were dog sitting him this week because my parents are enjoying a well deserved holiday. I miss living with him, but our dog Genna certainly didn't! Was fun to have him around for a few days. Dear Emma. You write beautifully, personally, openly and honestly without a hint of bitterness, and I LOVE your winter spice rice recipe, I am a big fan of throw together left over meals, wholesome, warming and hearty. Thanks for bringing more light to the WWW! Ooh I hadn't heard about all that but I just looked it up and the chefs come across really badly. Definitely makes me not ever want to go to their restaurants! Nice bit of publicity for that guy's blog anyway haha. I never understood the point of insulting people or criticising things they've spent time over, do people honestly not have anything better to do? Thanks for teaching me I havent been eating rice properly for ages ;) YUM! Great post! I think your a great blogger and enjoy reading your post. 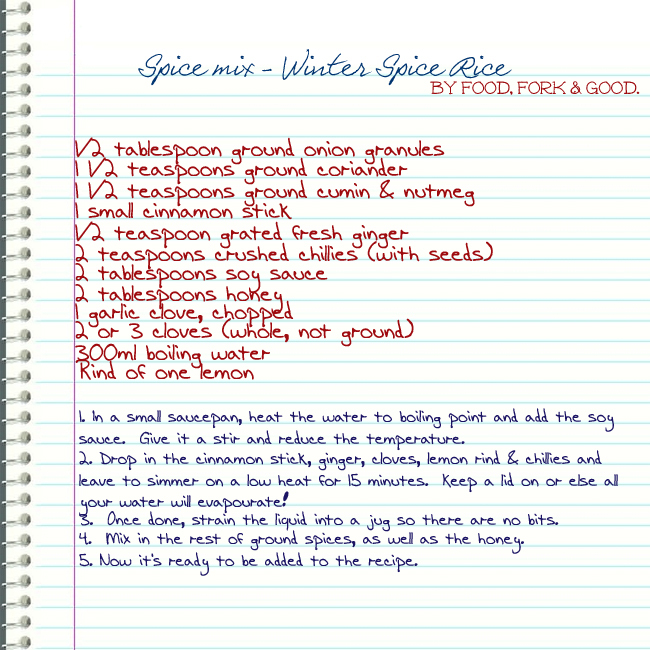 Your winter spice rice looks yummy! Perfect way to use leftovers and make a great rice meal out of it :) I also love your post about blogging and why you do it and I couldn't agree more. I just love to share recipes with like minded bloggers who enjoy learning different dishes and recipes. Keep it up, I always enjoy reading your blog. I love to read what you write...sincerely and real. The rice looks very flavourful and homey. Right up my alley! Well said and I am totally aligned with you on this... You have a new follower! Well, I guess I've been out of the loop because I hadn't heard about this news story yet Emma. What a well written post on the issue. You raise a good point -- what makes a writer professional? There are indeed lots of professional websites that people don't want to read, and lots of personal blogs that people absolutely adore. My day job involves lots of writing and I've come to the conclusion that "real writers" need to step up their game because blogs like this one are raising the bar for how we need to communicate. I love the spice combination in this dish -- it's the perfect winter dish. Emma how right you are! I have learned SO much from other food blogs, especially in the early days of Raw foods where there were no restaurants or cookbooks (or hardly any) around. From family recipes to cutting edge cuisine, from fun food snap shots to professional magazine worthy photographed food you can find it all! I'd be lost without them all. Cheers to that Emma! Your blog is your blog! Some people feel they need to push their ideas onto other people and put them down to feel better about themselves and in the long run it's only themselves they hurt! As for the rice is looks amazing as always! Have a wonderful weekend my friend! I'm just so annoyed by this "Michelin star" chef! Have some class, man. I love how he focuses on the one bad critique instead of being thankful for all the other good ones this food blogger gave him. What kind of grown man would use his status and voice to attack an individual and spread negativity towards an entire group of people in the process? *shrugs* What a baby. He needs to toughen up lol. ANYWAYS, now that I've finished writing a novel in your comments section, I'm about ready to whip up that rice recipe. It looks SOOO delicious! Amazing post Emma! So glad I found your blog. 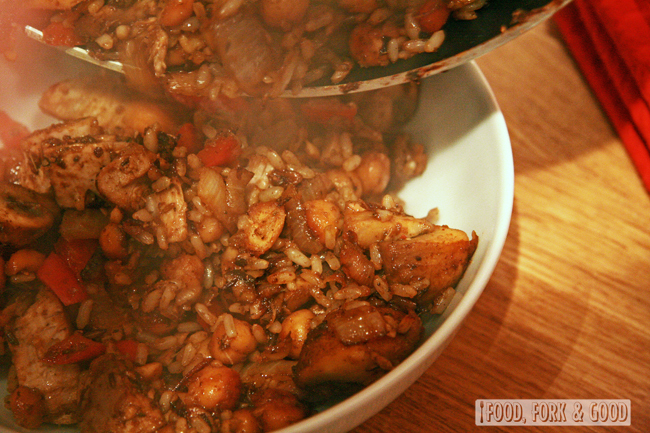 That Winter Spice rice looks INSANE!!!! 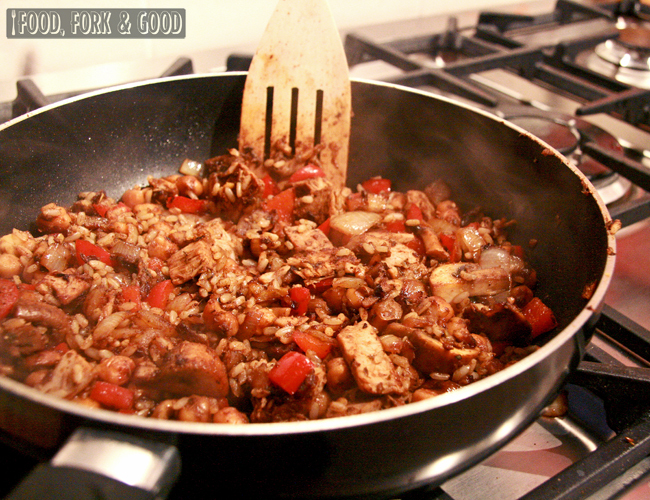 Thanks so much for sharing your thoughts, as well as this recipe! LOVED this post!! It is so true and I completely agree with you. I am seriously mad that people said any of that to you about your blog. Your blog is hands down one of my favorite reads. It is what you said personal and oh so enjoyable to read. I love your first picture it is too perfect you can see the steam coming off the deliciousness! Great post! I missed all of that hoo-ha, but great response to the issue at hand. Blogging is my outlet, too. It's a great place to share and communicate and it makes the world seem a smaller place. 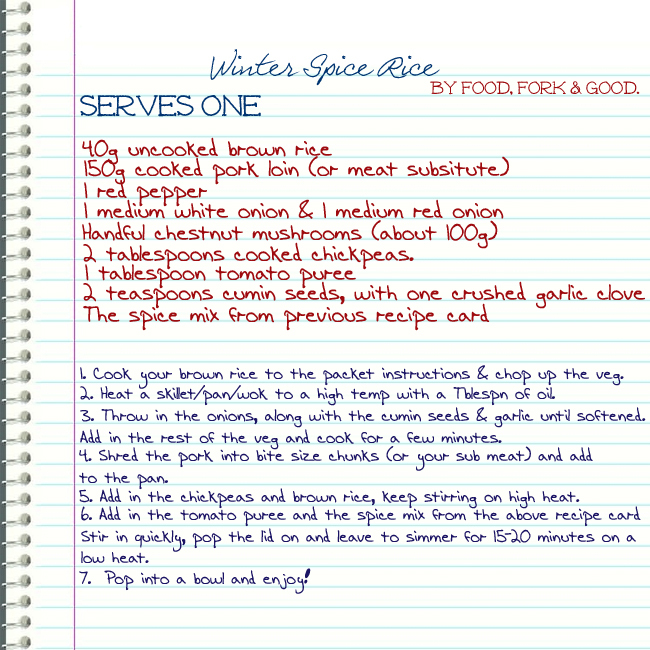 Love your winter spice rice....wrong season for us in the southern hemisphere but looks so tasty! !